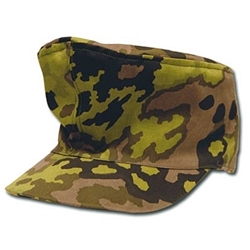 Reproduction of the WWII German SS M43 Field Cap in Mottled Oak Camo issued to the Waffen SS. Excellent quality cotton Mottled Oak Camouflage Pattern fabric in the correct colors. These caps are completely reversible to fall camo colors. Marked in German sizes and corresponding US hat sizes.